This is the story of Duke. Of how humans have failed him. And now he needs a miracle. Most animal rescue experts say focus on the positive attributes of the dog you’re trying to save, leave out the past. But in Duke’s case, his past is what created his present and, unfortunately, will affect his future. You see, Duke’s had really bad hands dealt to him. He was found tied to a pole outside a lady’s yard in New Orleans. Save-An-Angel, a New Orleans-based dog rescue operated by Oklahoma natives Kristie and Johnny Sullens, opened their hearts and brought him into the rescue. After a period of time, Duke finally had an adoption application that looked promising: Good family, good references, home visit checked out. Everything looked great! So, Duke was off to his forever home in Atlanta! A few months later during a routine check-up about Duke, the adopters confessed they’d given him away to a guy in New York because he “didn’t get along with their dog.” Never called Save-An-Angel, never tried to get a trainer to help work out the issue, just decided to get rid of him. Once in New York, Duke was subjected to horrific abuse. The new owner let his other dogs attack Duke. Repeatedly. Duke went from a happily-ever-after beginning to a never-ending nightmare at the hands of this new owner. Fast forward to now, and Save-An-Angel was able to get Duke back from this horrible situation, but the damage was done: Duke had become a fearful aggressive. Instead of waiting to see if a fellow dog was friendly, Duke was on the offensive, ready to stop an attack – whether real or not – before it happened. Through no fault of his own, Duke was now afraid of his own kind. And willing to fight to protect himself. Save-An-Angel put out a plea for a foster, as trainers felt it was his only real shot at a successful rehabilitation. Yet no one stepped up. Every volunteer they had was full or had no way of keeping Duke separated from their own dogs. The only option left was boarding, not an idea situation for him given his past and present condition. But Kristie and Johnny weren’t willing to give up on Duke, so boarding it was. Duke started out 2015 in a boarding facility in New Orleans where he began rehabilitation training. One day a kennel worker decided to get the hose out and play with Duke. Now, Duke is like my girls, Maggie and Katie – get out a hose and their excitement levels are off the charts! I’ve been nipped occasionally as they play in the water and go after the hose, which is exactly what Duke did. He didn’t attack, he was playing. But because the kennel worker was nipped, Duke was labeled “dangerous” and again, found himself without a home. Save-An-Angel rallied and found only one facility, knowing all his issues, willing to take Duke. SAA volunteers made a schedule, visiting Duke constantly, taking him for walks, car rides, hikes. His training was continuing. It was felt Duke had finally found a safe place, so Save-An-Angel decided to proceed with Duke’s heartworm treatment given the boarding facility could place him in a quiet, secluded area. Five months and $4,300 later, things were looking up. Just today, Kristie received a call that Duke’s boarding facility is being shut down temporarily. For how long, they don’t know. Which means Duke needs a new home. Boarding is no longer a viable option for Duke. He’s simply been bounced around too much and his training won’t stick unless he’s in a home / foster environment. Duke needs to learn he’s safe and loved in a quiet place while he’s being treated for heartworms. A kennel simply cannot provide that. Duke is temporarily staying with founders, Kristie and Johnny, but they have their hands full with three personal dogs, two of the rescue’s dogs, and a new baby in a tiny shotgun house. 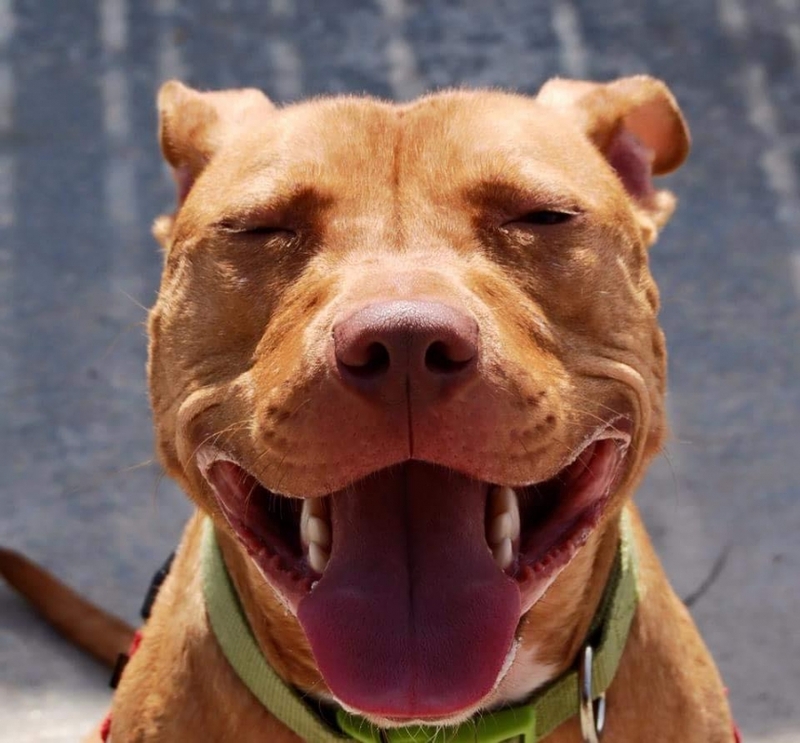 Ideally, they need an experienced, dedicated foster in New Orleans without any other dogs, or if they have other dogs, able to safely keep Duke and the other dogs separated. This isn’t a suggestion; it’s necessary. Duke has done well with his rehabilitation, but he is nowhere near ready to be loose with other dogs. Thus far, after months of trying to find a foster while he was in boarding, they’ve come up empty. And now the situation is critical. If we can find a viable foster in Oklahoma meeting the same criteria, I’ve offered to go get Duke this weekend. Kalyn McKenzie with Dogism has agreed to help with his rehabilitation and between the foster, Kalyn, and myself, we’ll be doing Extreme Makeover: Duke Edition. 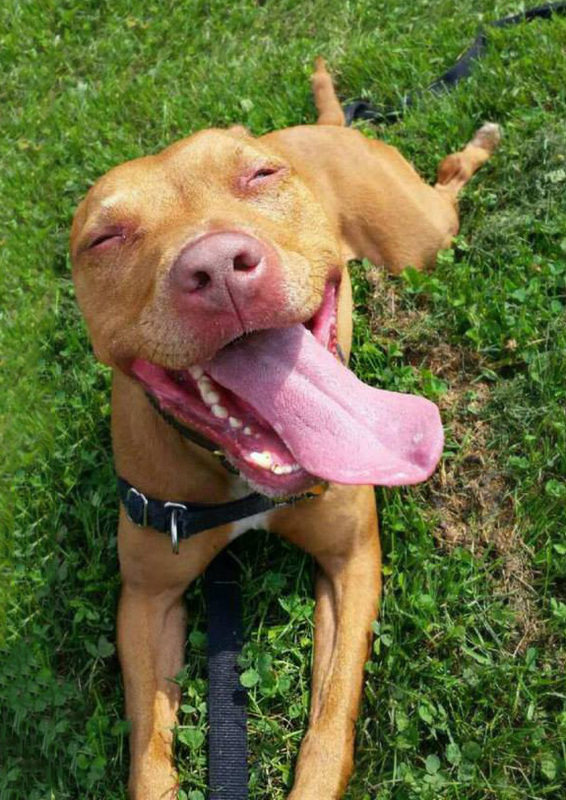 Save-An-Angel will still pay for all fostering costs, as well as his heartworm treatments. This would give Duke the chance for happiness he’s been denied his entire young life. So what happens if we can’t find a foster? Duke dies. No one wants to hear that and plenty are going to be angry upon reading this, but if a foster can’t be found, Duke is facing euthanasia. No rescue ever wants to make that call, but long-term boarding is no life for a dog, especially one with Duke’s heartworm condition and abandonment / abuse issues. It becomes a quality of life issue, and Duke won’t thrive as well as he would in a foster home. We wish it could be all butterflies and unicorns, but this is reality and there’s no sense glossing it over. He doesn’t deserve it. He simply doesn’t. Duke’s super people friendly and full of smiles. And sloppy kisses. He loves car rides. He absolutely craves attention and loves learning, shining during his training sessions. He’s thinks he’s a duck around water! He loves to hike! Duke is simply too full of love and life to have this as his final legacy. But we are out of options and the clock is ticking. Please, if you can find it in your heart to help Duke, call Kristie at (504) 638-2341. 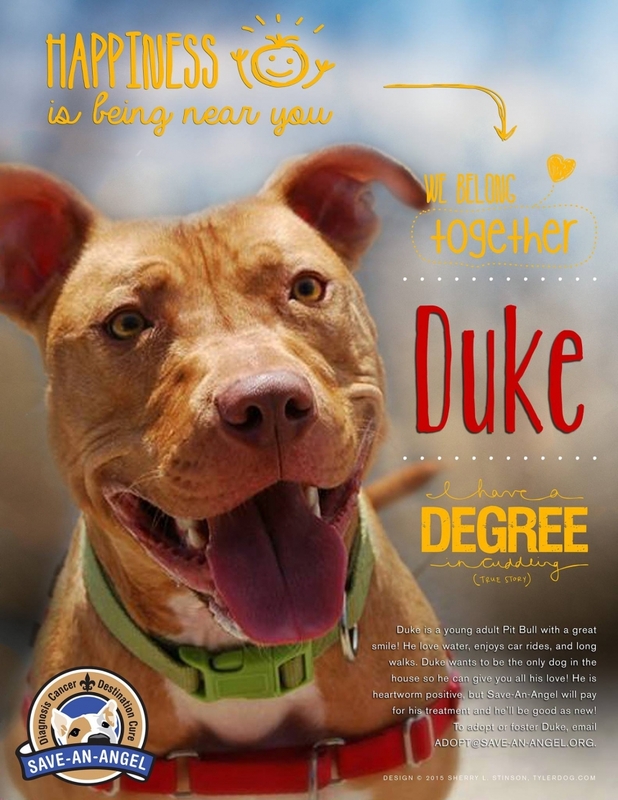 There are so many people lined up to help Duke, we just need the missing puzzle piece – a foster. Let’s not fail Duke this time. Duke is with a foster in New Orleans and is doing extremely well with his training. He is still desperately in need of a permanent foster or forever home. To follow his journey, visit Save-An-Angel on Facebook where they post videos and photos of his progress. If interested in adopting Duke, contact Kristie at (504) 638-2341. Requirements for adopting him are very stringent given how his previous adoption went, so please understand, not just “any” home will do. Duke is a special boy and deserves a special home where he’ll never have to be afraid or fight again. It is with the heaviest of hearts we share the news of Duke’s passing. Just a few weeks after putting out a national plea to save his life, Duke attacked and killed another animal while in foster care. This tragedy forced us (Save An Angel) to re-evaluate our responsibility to Duke and to the community as a whole. After working with three trainers, ranging from traditional to holistic; using anti-anxiety meds, and placing him in a home environment, it was clear Duke’s heightened state of anxiety wasn’t decreasing. No matter what we tried, Duke remained on high alert – a danger to other animals around him. After consulting with his trainers, other animal welfare professionals familiar with his past, as well as our Board, we determined it was best to euthanize Duke. Our mission as a rescue is to SAVE lives, so please know that this decision did not come easily or without great consideration. For months we did everything in our power to help Duke because we wanted to give him every chance at a happy life. We fell in love with Duke from the moment we rescued him off the streets. Sadly, the abuse he suffered early in life was too much to overcome. Duke was cremated alone and a memorial service is being planned to spread his ashes at the lake since he so loved the water. Duke taught us so much in our time together and his memory will be imprinted on our hearts forever. Run free sweet boy. You are finally at peace.